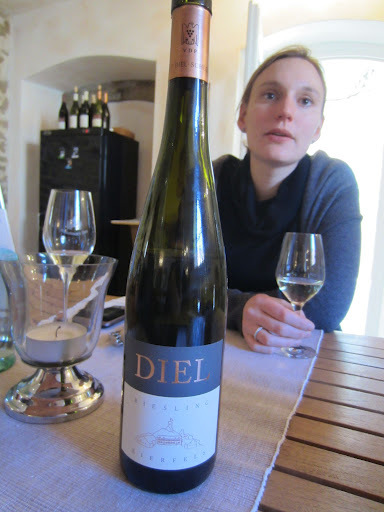 Compared to many of the rieslings I tried in the Mosel, the Nahe wines of Schlossgut Diel are brighter, zingier and slightly spritzy in nature. They don’t have the same minerality or the focus of the Mosel, but this may be a product of the vintage. There was a lovely consistent line between all the wines of grapefruit, which suggests to me the wines are made essentially the same, just the entry-level wines being blends of different vineyards. The trocken wines were particularly good; I think I liked them better than the dry wines of the Mosel. As a member of the VDP Diel use the vineyard classification system, so tasting the Grosses Gewachs wines was an experiment in more concentrated and austere characters. The 2010 wines had a similar nature in the Nahe as the Mosel, of higher acids and sugar so they are very crisp and citrussy in their acids. The Goldloch Spatlese was very complex and slightly savoury, showing some interesting crushed herb elements. We finished with a rose made from pinot noir, which was slightly spritzy and had 10g/L of residual sugar, so was very pleasant and easy to drink.